I painted my glasses red. 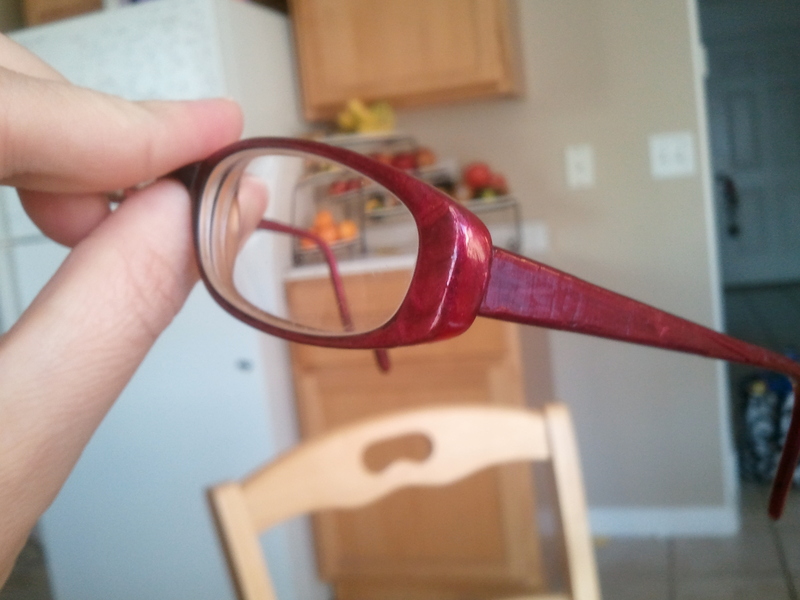 If you know me well, you might have noticed that the ‘tortise shell’ design on my very cheap glasses started to peel long ago. The scratchty/peeling surface left looked something like hard water deposits. Honestly, at first I thought they were hard water deposits. I probably should have taken a before picture… sorry. Sometimes I tried coloring them with brown magic markers. I even tried sanding it down a little to remove the peeling plastic, but that just made it worse. So on a whim, I decided to try painting them with nail polish. I had a purple bottle that I tried first. The result was awful, because the nail polish was rather sheer, and the sparkles in it were really very bright in contrast with what was left of the dark plastic brown. Well, I say it was terrible. I seriously doubt anyone noticed them looking worse than usual. But then… ah, then, I tried with my red paint. Care to try it yourself? Like I said, I had best luck with an opaque color. I also learned rather quickly that a series of short, overlapping, side-by-side strokes were much easier to control than trying to drag the color in one fell swoop along the length of the frame. This also made it easier to avoid getting nail polish on the lenses. I think it turned out smashingly! Now if only I had deep purple nail polish, right? But for now, the red is a riot. And I can switch to purple whenever I feel like it. Update: my skin has issues with metallic surfaces, and I should have realized the sparkly sheen in this nail polish might irritate my skin. Just a heads up and something to think about if you decide to paint your glasses. Next time I'll use a shiny-but-not-sparkly dark purple, I think.